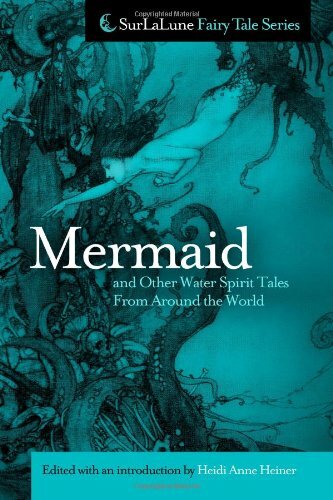 Merpeople are such a fascinating study- I've been reading all about different tales and beliefs about the Sea Spirits of Scandinavia in Surlalune's Mermaid Tales From Around the World. *On the other hand, they can also help to protect people who have shown them kindness. There's one story from Norway in which a fisherman saw a merman shivering from cold and gave him his hose to wear-later the same merman warned him of a coming storm and he got to shore just in time. *The River Spirit is called a Neck. He might sit on the water with a red cap on his head (interesting potential connection to Red Riding Hood?? ), but may also appear as a centaur, horse, or an old man with a long beard. They might punish cruel humans, such as haughty women who spurn their lovers, but may also themselves fall in love with a human woman and be a kind suitor. *Necks are also excellent musicians, playing gold harps. It's possible to get lessons from them, if you present them with a black lamb and the promise of salvation. *Sea creatures seem very concerned about their salvation in Scandinavia. There are multiple tales in which a neck cries and flings away his harp when told he will not be saved, but they cheer up if told that the opposite is true. In one story, a Neck asks a priest if he will have salvation, and the priest replies, "sooner will this cane sprout flowers." However, later on, his cane DOES sprout flowers, so he goes back and tells the Neck. This sheds some light on the motivation of Andersen's Little Mermaid-we often forget that she sacrifices her voice and the pain of her legs not just for the chance of love, but also to gain immortality. *There is a tale in Sweden with many variations, "The King's Son and Messeria." 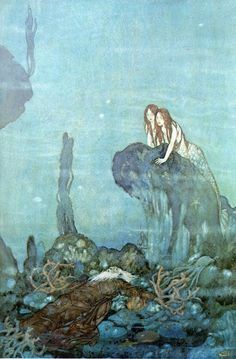 In it, a Mermaid has power over a young boy, usually because she tricks his parents into promising him to them (using the old "promise me what is under your girdle" trick to a woman who doesn't yet know she's pregnant, "promise me the first thing you meet on land," or just plain old "give me your firstborn or you'll die in this storm at sea.") They attempt to keep the boy away from the Mermaid, either keeping him in a high tower or away from water, but of course he eventually ends up close to the water and she drags him into her underground kingdom. There, he meets a beautiful young girl, also a captive of the Mermaid, and falls in love. The Mermaid gives him impossible tasks to do. Usually, impossible tasks in fairy tales are made possible because the protagonist was kind to animals along his or her journey, and they help them, so it almost feels like they were really a test of character-anyone who shows kindness will succeed-but these were truly meant to be impossible. Only by his lover helping him with magic, unbeknownst to the Mermaid, does he succeed. 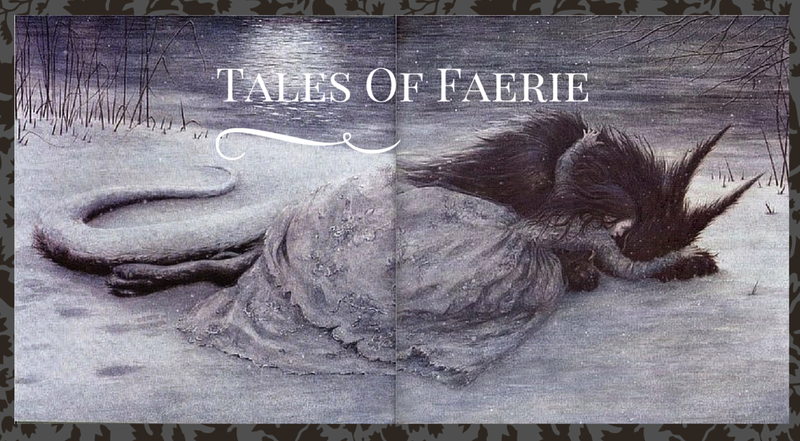 Mermaids in these stories are kidnappers; cruel, and unambiguously villains, functioning as a witch would in similar tales. The lovers manage to escape her, and sometimes she dies in spectacular ways-bursting because she tries to drink the sea (because the lovers transformed into ducks) and took in too much water, or splitting in two when she sees the sun. 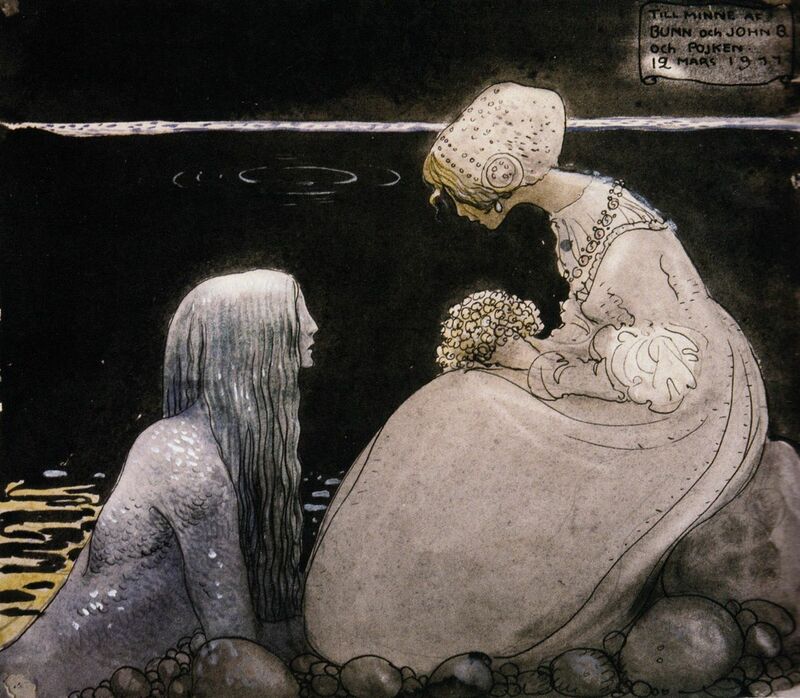 *There's a creepy Sea Nymph in Sweden whose hand will appear through a door in a fishing hut where the fishers are all asleep for the night. Wise fishers know to ignore the hand, but a boastful man claimed he wasn't afraid; he took the hand and it drew him out, and he disappeared for three years. He returned on the day of his wife's remarriage, for he was presumed dead, but disobeyed the Nymph's warning not to step inside the church, and he died three days later. *I have already posted on the Danish mermaid tales found in this book, if you want to read about more Scandinavian sea creatures!